Sergeant York and the Great War by Alvin C. York, ed. Richard "Little Bear" Wheeler. The edited diary of the war hero whose miraculous war achievements are almost surreal. Portrays his strong character, faith, and bravery. Sergeant York, VIDEO, starring Gary Cooper. 1941. Inspiring. 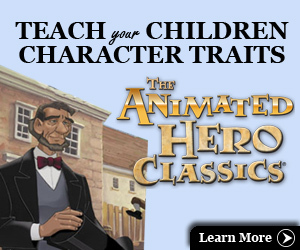 Portrays great character traits and heroic accomplishments. This teenager's actual diary documents her and her family's experiences living in hiding from the Nazis. See A Picture Book of Anne Frank below for this story for E-UE. Picture book, telling of the hardships of Japanese Americans during the war. This simple story delivers a big impact. Good ending. Content may be too serious for the K child. Post-war Japanese children were afraid of American soldiers who came to watch their sports day until one of the soldiers entertained them with his bicycle tricks. Charming story of an unforgettable event in the author's life. A young girl travels back in time and experiences the concentration camps, just as members of her family had done years before. She returns to the 20th century with renewed appreciation/understanding of her extended family. CAUTION for the sensitive: Portrays the cruelty and killings of the camps. Thousands of American Japanese were sent to internment camps by the American government during WW II. The author was one of them and writes of her experiences and the effects the camps had on her and her family. Lots of photos & full-page maps. Two page spread for every major topic gives a well-rounded & captivating review from beginning to end. If you just get one book on WWII, get this. True story of a Christian family's efforts to hide Jews from the Nazis in Holland, their consequent arrest, and their experiences in the concentration camps. Corrie is the sole survivor. Her faith and fortitude are inspirational. Caution: The cruelty in the camps is honestly portrayed. Note: The story is also told on video: The Hiding Place. Newbery Honor. A young boy is separated from his parents in war-torn China. The greatest value in this book (& its sequel) is that this story is rarely told & not vey well-known. The Japanese-Americans from California were quarantined into camps during WWII, experiencing hardships and loss of business and property. This book tells of one Japanese-American family's journey to the camp, and its sequel, Journey Home, chronicles them going back home with all its challenges. Both books are based on the author's own experiences as a child. While living in Holland during the German occupation, Johanna helps save a town's treasured heirloom from the German soldiers. Gives children insight into the war without gruesome details. Recommended. The watercolor illustrations and almost poetic text give a realistic idea of what the rescue at Dunkirk was really like. Awe inspiring to think of the impact that ordinary people had in this success. The Navajos provided a way of communication undecipherable to the Germans during the war. Not yet reviewed. Anna's mother makes sure Anna gets a coat in the midst of the hardships of the war. Newbery Medal. A Holocaust story with an uplifting message and a happier ending. When the Germans decide to relocate the Danish Jews, the people of Denmark rise to save them, demonstrated in this story in the bravery of a 10-year-old girl. Recommended. See The Yellow Star. A Picture Book of Anne Frank by David A. Aler, ill. Karen Ritz. Holiday House, 1994. E-UE. This somber story is tastefully told and illustrated for the younger grades. See above for the full, unabridged version. Wallenberg's inspirational courage and compassion in rescuing Jews in Budapest, Hungary. Not yet reviewed. A little girl gives her savings to help rescue a girl her own age from war-torn Europe. The "Thunderbolt," the bomb dropped on Hiroshima, had devastating results even after the war. This is one girl's sad story, interwoven with the Japanese legend of the cranes. The children of a small town in Norway carried out a daring plan to smuggle a fortune in gold out of the country, keeping it out of Nazi hands. After learning the basic facts of WWII, spice it up with these intriguing stories-behind-the-stories. Simple and exciting, this story is about children who help other children hide from the Nazis. When Hitler Stole Pink Rabbit by Judith Kerr. Coward-McCann Inc., 1972. UE-JH. A Jewish family leaves Germany in the nick of time, and moves to several countries during the war to keep their freedoms. Based on the author's childhood. Caution: Briefly mentions a family friend's suicide (sleeping pills). This one-of-a-kind Holocaust story is a first-hand account of miraculous survival in a Jewish ghetto. The memories of a child survivor are heart-rending but without horrific details, allowing for a younger reader. Recommended. Cautionary Notes: Although told with tact, story does include Jews shot on sight, Jews herded into trains, children hidden in a dark basement, and general cruelty/fear of the German soldiers. Moving in its simplicity, this legend reminds us of the heroes who shone during the dark days of WWII in their resistance against the persecution of the Jews. See Number the Stars.